BALDWIN PARK >> A man with a pistol robbed a Baldwin Park market on Wednesday evening, authorities said. The heist took place about 7 p.m. at Frank’s Market, 5026 Main Ave., Baldwin Park police Sgt. Jorge Huerta said. A robber entered the store, brandished a semi-automatic handgun and demanded cash, the sergeant said. The clerk complied and was not injured. The gunman fled with an undetermined amount of money, Huerta said. He was described a white man, about 5 feet 8 inches tall, 165 pounds, with tattoos on the back of his neck. He wore a black shirt and blue pants. Police said the robber was last seen running north along Main Ave., toward Arrow Highway. Anyone with information can reach Baldwin Park police at 626-960-1955. Tips may also be submitted anonymously to L.A. Regional Crime Stoppers at 800-222-8477. PASADENA >> A man lost his wallet to an armed robber along Colorado Boulevard in downtown Pasadena on Thursday night, police said. The crime unfolded about 9:40 p.m. as the victim, a 22-year-old man visiting Pasadena from Northern California, was walking east along Colorado Boulevard near Los Robles Avenue, according to Pasadena police Lt. Jesse Aguilar. “The suspect approached him from behind and produced a handgun from his waistband,” Aguilar said. The robber demanded the victim’s wallet, which he turned over. The robber was last seen running south on Los Robles Avenue, accompanied by four other people. He was described as a Black man between 20 and 23 years old, about 5 feet 11 inches tall and 150 pounds, with short curly hair, Aguilar said. He wore a Los Angeles Dodgers baseball cap, a black hooded sweatshirt and blue jeans. No description of his four companions was available. LA PUENTE >> Detectives arrested a man in La Puente who was being sought in connection with a home-invasion robbery and attempted murder in northern California, authorities said. The arrest took place about 11 a.m. in the area of Main Street and Chatterton Avenue, Los Angeles County sheriff’s Capt. Tim Murakami said. Detectives assigned to the Industry Station were notified by Clearlake Police Department investigators that a suspect in a home-invasion robbery and attempted murder case they were investigating was believed to be in La Puente, the captain said. Officials conducted a stake-out at a home where the suspect was expected to visit, he said. They spotted the suspect and took him into custody without incident about 11 a.m. 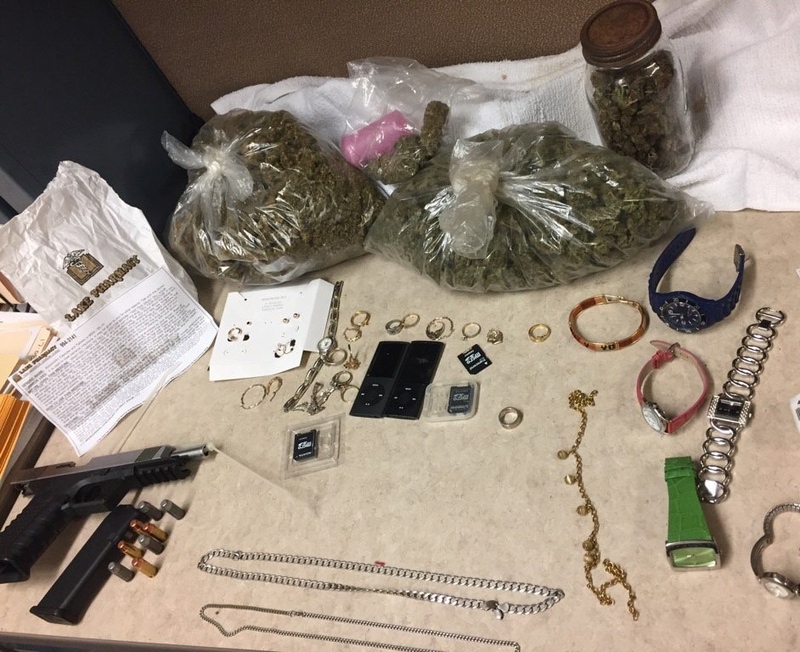 Inside a bag carried by the suspect was a handgun believed to have been used in the Clearlake crime, as well as items believed to have been stolen, including two bags and a jar filled with marijuana, Murakami said. The suspect was being held on a warrant and was expected to be sent back to Lake County to face charges, the captain added. His identity was not available Friday. Representatives of the Clearlake Police Department, a 21-officer department serving a community of about 15,000 people, were not available to discuss the crime in their jurisdiction. Clearlake police are investigating the shooting of a woman that took place at a home on Thursday, according to a statement issued on the department’s Facebook page. Few details were released regarding the shooting, and officials said on Friday that they could not confirm whether that was the crime for which the suspect arrested Friday in La Puente was being sought.